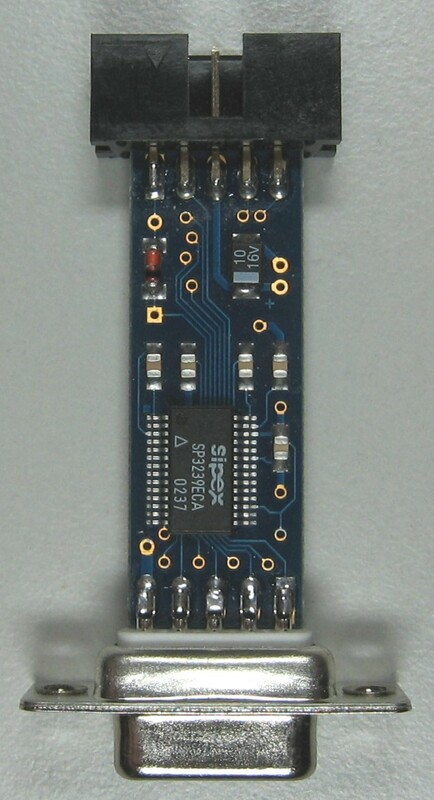 In 2002 we defined a proprietary 10pin header for all our microcontroller-designs to connect a serial debug terminal to the µC. 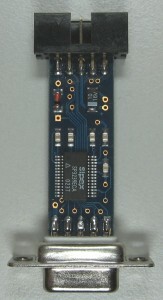 Therefore we designed a LVTTL-RS232 interface which fits into a DB9-donglebox with standard RS232 signals on a DB9-female connector. To meet the requirements of our various designs, the interface handles signal-levels from 2,7V up to 5,5V inside and converts them to standard RS-232 levels. Six pins were defined with serial functions Tx, Rx, RTS, CTS, Ground and Vcc. To make developement cycles more easy, we connected additional four pins to System-Reset and two pins have been reserved for acces to i2c-Bus on some systems. System Reset is open drain and could be asserted by the serial DTR line. On EScape we added the Debug connector to make BeagleBone’s debug console (uart0) available. System-Reset can be activated by DTR and as an option it is possible to activate BBB’s Power-Button with the CTS-line. Therefore an optional rectitfier must be mounted on position D37.